dave & i both unintentionally created cliffhangers last week via social media and i thought i would take some time to address them both. in an instagram post last week dave mentioned moose was spending the day at our vet for cushing’s testing. moose has been having some issues the past several weeks and we were struggling to get to the bottom of them. for weeks he has been drinking all of the water (all.of.the.water) and subsequently flooding our house on a constant basis. he definitely had a uti and treatment seemed to make the situation better until it was no longer better. after more testing and the emergence of some further symptoms we (and by we i mean our vet) nailed down the diagnosis. moose has pituitary dependent cushing’s and hypothyroidism with a secondary uti. myself, dave, moose and our floors and carpets are happy to report that after 1-1/2 weeks on medication he is doing so much better. he seems more himself and our house is drying out. because we haven’t had him a terribly long time and realistically don’t “know” him some of his symptoms were a bit evasive and some seemed like just a bulldog in summer; ie, panting more, drinking more water, less active. now that he’s being treated we can clearly see that he feels better and is more himself. i hate that it took us so long to nail down the diagnosis and that we missed some signs but unfortunately that can be part and parcel with a newly adopted rescue dog. in a blog post last week i mentioned that we potentially may not be able to stay in our current home and place of operation for earthdog and some people were wondering why. earthdog has now been in business for 20 years and as such, in a fast-paced, changing retail landscape we could probably be considered dinosaurs. adaptation to social media demands and e-commerce trends require constant attention and in some ways neither of us are the best adaptors. one particular thing we grapple with is that we are two people who are generally allergic to attention and cameras being pointed our way. not the best characteristics to have in the age of selfies, self-promoting, inside looks and “behind the curtain” sensibilities that are so popular now. we would much prefer to let the dogs be the face of our business! the state of retail continues to change rapidly and many of our retailers have closed, sold their stores or changed their business model. clearly many of our cherished, independent retailers have been faced with their own challenges of rising rents and trying to compete with amazon. we made the decision at the very start to not sell to big box stores or large, discount websites. that has definitely held us back to a degree but we’ve always felt that it was better to stand for something and we would never had built the business we did if it weren’t for the “little guys” who brought earthdog into their stores. interestingly, at the same time we have seen the rise of earthdog popularity overseas, particularly in japan and south korea where dog culture is clearly changing. it is still a trip for us to see on instagram these products we make pop up on dogs in far away places with captions and comments that we can’t read. we are currently trying to work out what earthdog 2.0 should look like. we all love this house and it felt like home the minute we saw it so we’re hoping to stay but if that can’t happen i will be forever grateful for the time we’ve had here. for now we’re going to adapt, change and grow however we can. that means focusing on the things we do best, like our decorative line (new styles in the works), exploring and being open to new ideas and inspirations that we can bring forth from our dog-centric life and identifying new venues to promote and sell earthdog. 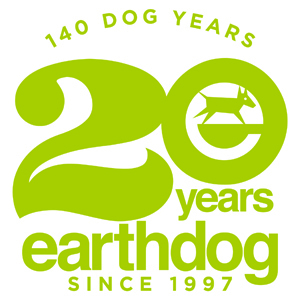 let me know if there’s a great dog product supply shop where you are that should be selling earthdog! Love you guys, what you do, and how you do it. Best wishes. I was just rereading about Moose’s diagnosis. Our Daisy, in my profile photo, has just been diagnosed with Cushings. Like you we had some difficulty pinning down some of the symptoms because it can stay in the 100° well into November here. The muscle loss and “accidents” gave us a direction and looking back the symptoms stood out loud and clear. Daisy is also now doing well on medication, but it will take time for skin and coat damage to get better. Cushings is an awful disease. hi tonna, i'm so sorry to hear about daisy - glad to hear she's doing well on the meds. moose is doing great - it took a bit of time on the meds for the last of his sores to appear and then heal but now his skin is completely healed, no new sores and his coat has grown in beautifully (he had absolutely no hair regrowth after his amputation last feb so that's a big deal) and i think that all happened within about 2 months of meds. hope daisy has the same experience. thanks so much patty - we'll look into them!